Gold prices were slightly lower but were reverse earlier losses shaking off two European debt downgrades and a stronger U.S. dollar. NEW YORK ( TheStreet ) - Gold prices were reversing earlier losses Friday as the stock market shook off two European debt downgrades and a stronger U.S. dollar. Gold for December delivery was losing $4.80 at $1,691.10 an ounce at the Comex division of the New York Mercantile Exchange. The gold price has traded as high as $1,702.70 and as low as $1,672.60 an ounce while the spot price was down $6, according to Kitco's gold index. Silver prices were shedding 54 cents at $31.34 an ounce while the U.S. dollar index was up 0.53% at $79.55. Gold prices were following stocks higher as short covering buoyed the market, leaving traders with less need to liquidate their gold positions. Gold prices had been almost $20 lower in early trading after Moody's slashed Hungary's credit rating to junk status following a similar move by Fitch on Portugal, which weighed on the euro and boosted the dollar. 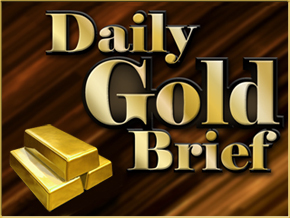 U.S. markets are open for only a half day Friday and light volume coupled with a higher stock market were magnifying the volatility in gold. "We could see $1,650 support and now $1,725 resistance," says George Gero, senior vice president at RBC Capital Markets. Despite longer and more substantial lending from the International Monetary Fund, Europe still can't find a credible solution to its debt crisis. German Chancellor Angela Merkel and French President Sarkozy promise to discuss changes to the European Union treaty in a summit December 9th. Any sort of grand action, including more firepower from the European Central Bank or Eurobonds, would require changes. The two leaders still disagree on fundamental issues like the ECB lending unlimited amounts to countries. "The Eurozone is looking worse than the U.S." say Ross Norman, CEO of SharpsPixley, "a firmer U.S. dollar, weak euro has taken a little bit of a shine off of gold.' Norman notes, however, that speculative long positions on the Comex are growing, which he says means traders are rebuilding positions after the big washout in September when prices tanked 10% in weeks. There is "doubt about policy makers' ability to come to a consensus and come up with a proposal that the populous will accept," which he argues will continue to be positive for gold despite short term volatility. Italy was able to raise 10 billion euro over 6 months at an auction earlier today but had to pay almost double what it did at its last auction. There weren't that many buyers, pointing to investors' reluctance to lend money to the country. Underpinning gold's volatility has also been a slew of central bank buying. According to the IMF, Russia, Belarus, Colombia, Kazakhstan and Mexico bought 25.8 tons of gold in October. Conversely, German cut 4.7tons of gold from its reserve to mint coins. Tajikistan also cut 0.4 tons. "These central banks, including China and Russia, hold huge U.S. dollar and other fx reserves. Even a small shift to gold will have a major effect on its price," says Mark O'Byrne, executive director of GoldCcre, a bullion dealer. "Despite the increase in central bank gold reserves, their central banks still only hold some 5% of their reserves in gold." The theory goes that if central banks increase their percentage holdings of gold even slightly they would have to buy a significant amount of gold to reach that target. "Even a small portfolio reserve allocation into gold would create a very large increase in demand for gold." Gold mining stocks were mixed Friday. Barrick Gold ( ABX was adding 0.58% to $48.24 while Newmont Mining ( NEM - Get Report) was rising 0.39% at $64.46. Other gold stocks, Goldcorp ( GG - Get Report) and Randgold Resources ( GOLD - Get Report) were trading modestly lower at $48.21 and $104.84, respectively.